Today at the D23 EXPO 2015, The Walt Disney Company Chairman and CEO Bob Iger announced to an audience of more than 7,500 fans that Star Wars-themed lands will be coming to Disneyland park in Anaheim, Calif., and Disney’s Hollywood Studios at Walt Disney World Resort in Orlando, Fla., allowing Star Wars fans to step into the stories from a galaxy far, far away. 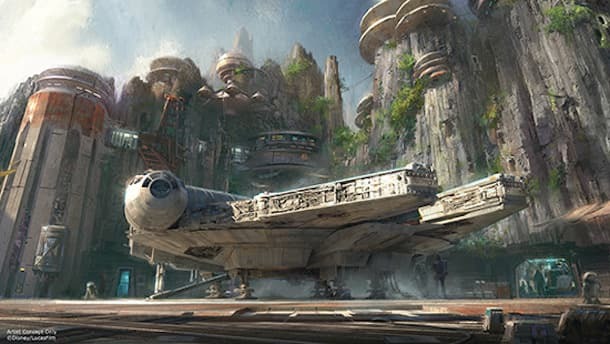 These authentic lands will have two signature attractions, including the ability to take the controls of one of the most recognizable ships in the galaxy, the Millennium Falcon, on a customized secret mission, and an epic Star Wars adventure that puts guests in the middle of a climactic battle. Keep an eye on the Disney Parks Blog for more news coming out of D23 EXPO 2015 this afternoon from the Walt Disney Parks and Resorts presentation. Yay, so totally stoked for this to open..14 acres, sweet. We go every weekend-buy lots of stuff there, because Disney is awesome and hires awesome people-love going to the happiest place on earth. I keep hearing it will take over Toontown though and I keep seeing you post that it will be taking over the big thunder area. Will Toontown remain? We’re so excited to see WDW’s new expansions! Where will Star Wars Land and Toy Story Land be built in Disney Hollywood Studios? I can’t wait for this to happen. I have been coming to Disney World since they opened it, having grown up in Hollywood, Florida.I brought my children; I have brought my grandchildren;I have a great grandson, and more coming, and I will bring them, too. This will be so utterly awesome, the only people who can do this right is Disney. These parks are going to blow open the entire industry. It is quite obvious that Disneyland is deemed the ‘Happiest Place on Earth’ and there is no question as to why. The addition of the all new Star Wars Land to Disneyland Parks will have a tremendous impact to the parks’ every growing fan base. The marketing practice within the article explaining the release of the news is very tactful and exciting. 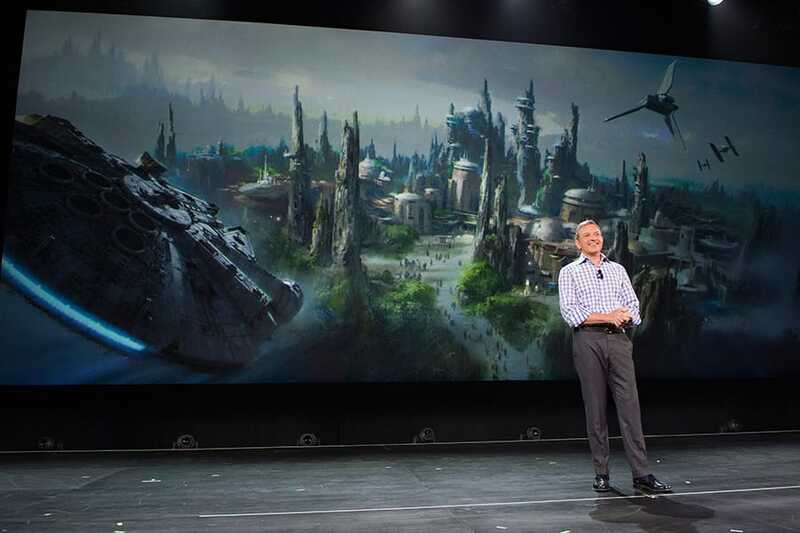 Over 8,000 fans came to listen to what CEO and Chairman, Bob Iger, of Walt Disney had to say about the new release. He continues on to explain that this will not only be the largest expansion Disney has ever done, but also the largest land Disneyland and Disneyworld will have in the parks. I really enjoy that Disney is catering to a wider target market of their park goers, including the older crowd who watched the very first Star Wars movies, and for children of all ages. WDW ROCKS!! Keeping the Dream alive. Also looking forward to Avatar @ Animal Kingdom. This is fantastic news. Can’t wait for it to open. Will there be a Marvel Land in the future? Nadine– Big Thunder Mountain Railroad is safe. It is only Big Thunder Ranch that will be removed (the petting zoo and BBQ restaurant) as well as some nearby backstage areas. Hello there everyone is asking about what’s happening to rides when this star wars stuff is happening what’s going to happen to thunder mountain ???? And when will it he knocked down ???? 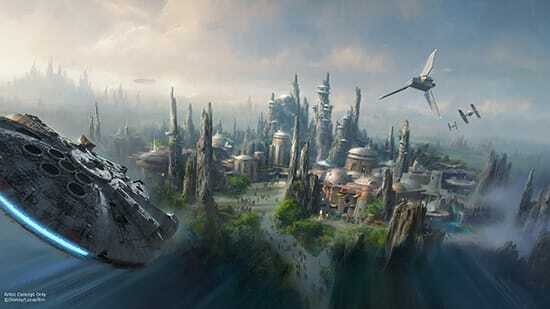 It has been confirmed that the Star Wars land will replace Big Thunder Ranch, as well as some nearby backstage areas. Toontown will not be removed. Are you guys gonna tear down toontown in disneyland for star wars land ? Where exactly is this to be built in relation to Disneyland and CA? What will happen to the beloved Big Thunder Ranch Bbq? Lando’s Cloud City Suites Inn, lol…. 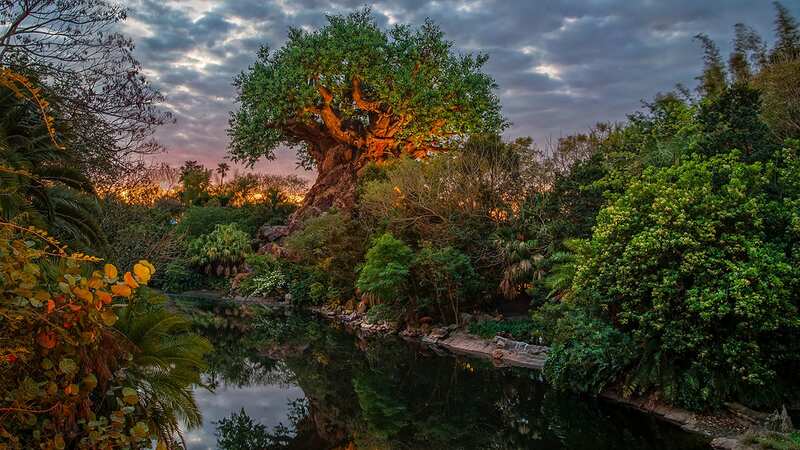 Some of the press stories about this expansion, both at Disneyland Resort and Disney World, are referring to the new areas as “parks” which, to me, would mean that a separate admission would be required. But the article above describes them as “lands” which would, for example in the case of Disneyland, make them a part of the single park admission ticket. Thanks, Aram – These will both be themed lands within each park; meaning that access will be included with Disneyland park or Disney’s Hollywood Studios admission. Saw this last night on E! News an WE ARE SUPER EXCITED!!! What a great edition to the parks and we are already wanting to plan our trip to see it all. My son is PUMPED!!!!! Towntown in Disneyland had always been superior to the Toontown Fair in Disney World. It is not just a place to meet Mickey (in his house). It also has Roger Rabbit’s Car Toon Spin. And regardless f what some people say, the Roger Rabbit character is still relevant and loved my many people. True, Mickey’s Toontown could use a little work in places, but that is another matter that they can still address in the future. Plus, it has already been confirmed by some legitimate news outlets that Toontown is not being removed. Also, I wouldn’t be too concerned about Star Wars Land’s location (away from Tomorrowland). Your comments here mention that the star wars land will be in the big thunder ranch area, but there are a couple of questions. 2) I presume when you say that it will be in the “located in the Big Thunder Ranch area” that the Big Thunder Ranch BBQ and the Big Thunder Ranch with the stage and pavilion there will be going away, and thus the petting zoo as well? Also a lot of people have asked a specific question on if toon town will be closed as well, a lot of the news reports show this to be the case, but you have not actually answered that question. You have said that it will be in the Big Thunder Ranch area, but you did not say that it would not extend into the toon town area. I think a lot of people would be ok with this. Toon Town’s whole purpose seems to be a place to meet Mickey Mouse, which doesn’t really need an entire land, the magic kingdom sacrificed their version of toon town to expand fantasy land and it seems to have gone over really well, inquiring minds simply want to know, will toon town stay or will it go? As a kid that grew up wanting to be Han Solo, I am an adult now (that still kinda wants the same thing) wanting to propose to the love of my life. I hope there would be some sort of package I can take advantage of to make my proposal ripple the Force throughout the galaxy!!! Will Star Tours be Relocated? Will this — as well as the construction of Toy Story Land — affect the Streets of America area? And will One Man’s Dream close? Please don’t name it “Star Wars Land” …. That would be just as bad as “Carsland” (which should have just been called Radiator Springs). I am a huge Star Wars fan but have mixed feelings about this plan for Disneyland. That park is so crowded and jam packed already, and while California Adventure is just starting to catch up, it really could use the boost. There will be a massive imbalance in park attendance after Star Wars Land is built. Disney Executives, please reconsider the location for this amazing new land and please don’t shoehorn it into Walt’s original, iconic theme park! Sounds like this will add a whole new dimension to the thrill of going to Disneyworld. I hope it too will be a magical experience. Count me in…I will be the one in line trying to be the first one to experience it!!! I hope this means star tours in Disneyland will be relocated and that bottleneck between ST and Buzz Lightyear Astro Blasters can be fixed. making that walkway wider and moving the stroller parking somewhere else would be a huge improvement on the entrance to tomorrowland. Based on what I have seen it appears that the 14 acre spot would essentially eliminate Toon Town and Thunder Ranch in the North East corner in the park. Small World and Thunder Mountain would not be affected. This is awesome! Between the new tallest coaster in world, and now Disney with Star Wars, so much awesome stuff coming to Orlando area. We are on a fixed income, and we are saving NOW for next year!!! Christmas would be a wonderful time! The reality of all this is those that grew up with the original Star Wars will be senior citizens by the time these lands are completed. Thrill rides will not be an option for most if not all of them. The accessibility factor involved with the “experience” will be major issue in the planning phase. Very exciting news for Hollywood Studios. Just don’t wait 5 years to break ground and then take another 5 years to build. Ground should have been broken long ago with all the closures in the park. Having never seen a Star Wars movie, my general feeling on this expansion is “meh.” On one hand, I’m disappointed some Hollywood Studio things I enjoyed are no longer there, and this land simply doesn’t appeal to me. On the other hand, I’m hoping the popularity of Star Wars will pull crowds in with the the effect of less people elsewhere in the parks. This is a new day, a new beginning. Disney, may the force be with you. Any clue as a time frame of when it may be open? In the next 2 months my family will be making plans for 2016 vacation and we would absolutely love to go to Disney World. My 7 yr.old son goes nuts over Star Wars. The whole family are fans. I have never been so disappointed in Disney before. I seriously doubt this is what Walt Disney had in mind when he wanted a family place. Taking away amazing attractions to replace it with something that is not well enjoyed by the mass population is horrible. This is for one group of people and them only. If this the way Disney is going to change their image, to only think about how much money they can make and not about what all families can enjoy, I’m not sure I want to continue to give my hard earn money to this company. Star Wars takes place BEFORE our history so placing it near TL would be foolish. Imagineers won’t miss this detail. @Erin Glover. There is talk about Tomorrowland being changed to have more Star Wars as well as the new Star Wars Land. It seems to me like it will turn into two different Star Wars lands. Please tell me that once Star Wars Land is built Tomorrowland will no longer be Mini-Star Wars Land so valuable real estate can be use for other creations, or is Disneyland going to essentially have two different Star Wars Lands? @Jonathon- it makes no sense to put a Radiator Springs ride at Hollywood Studios when there is Test Track at Epcot. It’s essentially the same ride, just a different theme.